ampm is running a great contest forU.S residents where they are giving away big prizes. ampm runs famous food stores in U.S. In ampm store you will get hot foods, beverage etc. 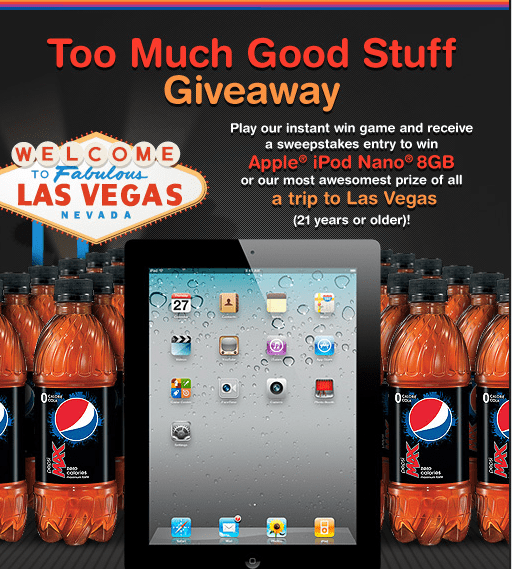 ampm is running this contest in their Facebook page where you can win grand prize- a trip to Las Vegas, Nevada. 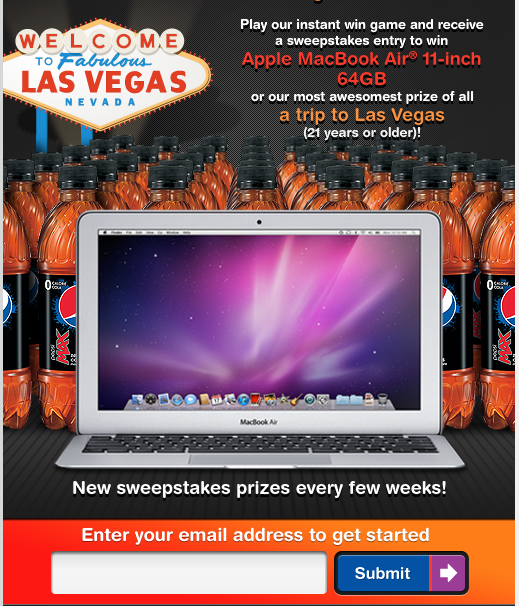 There are more amazing periodic Sweepstakes prizes like Apple iPod Nanos, Apple iPod Touches, Apple iPads or an Apple MacBook Air. There is also instant win game where one can win by spinning a virtual slot machine. To enter this contest you don’t need to buy anything or spend a penny just visit ampm Facebook page Too Much Good Stuffand ‘Like’ it. Now register in contest by giving your details like name, address (U.S only) email address etc. After completing registration play the instant Win Game by spinning the reels of virtual slot machine. If all three reels match each other at the end of the virtual spin you’re a winner!! You will be automatically entered into the drawing of contest after playing the instant win game. Now you can win the Grand prize and Sweepstakes prizes. ampm is also giving away 15,000 bottles of Pepsi max and 10,000 corn dogs in the Instant Win Game. When you visit ampm, you must try ampm‘s specialties including the Thirst Oasis, which has up to 24 flavors of different fountain drinks, a choice of crushed or cubed ice, and a fresh condiment bar. Have you ever been in ampm stores? what do you think about their snacks and convenience of the stores?